1. Currently, we do not ship to a APO/FPO address. 2. To ship your DIAPER or PULL-UPS order we use FedEx Ground, FedEx Home Delivery, and FedEx SmartPost. Expected delivery time for DIAPER AND PULL-UPS ORDER is 2-5 business days via FedEx Ground or Home delivery to receive your order and it dependents on the state where your order shipping to in the USA. For customers who purchase one or two packs of diaper or pull-ups (pants) we usually use Fedex smart post and it takes 3-6 business days to receive it. Our company currently has a warehouse in Miami FL. If you placed an order before 2 PM EST on Monday through Friday all orders will be shipped the same day. If these criteria are not met, all others orders will be prepared and shipped the following business day. On the occasion of observed holidays in the USA, orders may be prepared but not shipped during any such events. 3. Following your shipment being processed, we will send you confirmation over email with a tracking number. 4. All terms, condition, and policies are subject to change at any time without notice. Customers from Mexico, Alaska, Virgin Island of the US, Puerto Rico, Guam, Hawaii and US Minor Outlying. Unfortunately, we do not ship to these areas. 5. Following your shipment being processed, we will send you confirmation over email with a tracking number. 6. If you wish to return or exchange your DIAPER or PULL-UPS order this can be done within 7 days after purchasing. Returned items must be unopened and unused in their original and new condition. To successfully complete a return, an invoice or proof purchase is required. For all returns, customers are responsible for all packaging and shipping costs plus 10% restocking fee taken from the total price of your purchase. For items that arrive damaged or with missing parts, no refund will be provided. Unfortunately, we do not accept milk formula returns because it is perishable. We do it to protect our inventory and clients. We ship all products in new conditional, unused and unopened from our clean warehouse. 7. If you order 1 pack of milk formula and we will ship it in a padded envelope. Shipping in the padded envelope may result in some damage while traveling, which we are not responsible for. As orders of 2 or more packs are shipped in USPS Priority mail boxes, decreasing the likelihood of damage, we recommend our customers to order 2 or more packs of milk formula for avoiding any complaints from you. If you order a Large amount of Milk Formula we use FedEx Ground or Home delivery and it takes 2-4 business days to receive your order and it depends on where you are located. 8. We offer free shipping DIAPER, PULL-UPS, MILK FORMULA to the following zip codes (if eligible) in Florida: 33160, 33180, 33009, 33162, 33019, 33154, 33008, 33181. To become eligible, customers who are shipping to one of these zip codes must purchase more than 1 package of diapers/ pull-ups. 9. 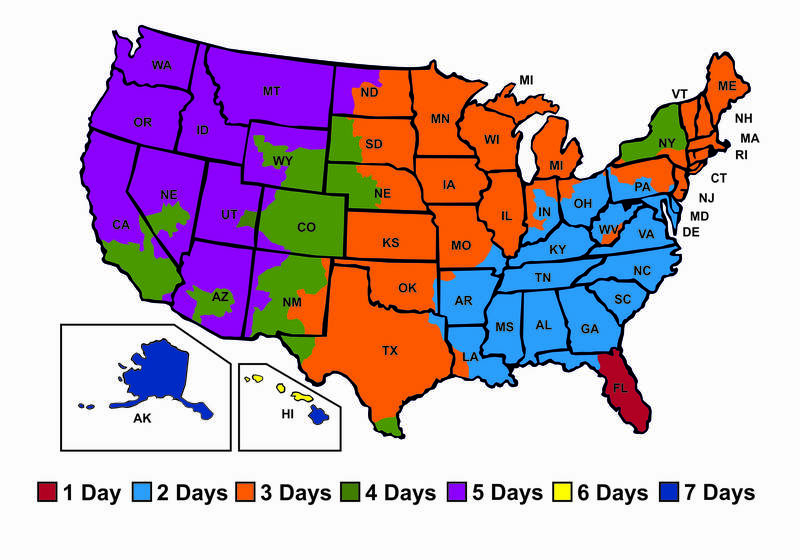 Map below is showing an estimated delivery time to each state.